I’m always more nervous about giving introductory/overview sessions than I am about full-on technical sessions. My database consolidation session is a little bit like a history lesson of consolidation, including old and new. The response was very good. I had a lot of people wanting to speak to me afterward, which meant I missed the next two sessions. I don’t mind that, as I feel my purpose here is to interact with as many people as possible. As long as people want to speak to me I’m willing to speak. After lunch I had a major energy crash again. Whenever I was speaking to people I felt really up-beat, but as soon as the conversation stopped I felt like I wanted to collapse on the floor and sleep. To play it safe I went back to my room to sleep for a couple of hours. Next up I went to see Debaditya Chatterjee and Giridhar Ravipati speaking about “Oracle Multitenant Best Practices”. Some points that came out of that were. Always use the AL32UTF8 character set for the CDB. Most other character sets can be converted to that to allow them to become PDBs and in a future version, we might be able to plug in a PDB with any character set, provided it is a subset of the CDB character set. Use OMF, as it simplifies file management substantially. Consider the impact of operations, like patching. Are you patching all PDBs, or not? If not, you will be using the unplug/plug approach to patching. Standardise as much as possible. Size SGA, redo and undo correctly to allow for the combined needs of the consolidated workload. Always use Resource Manager to control resource usage of each PDB. Don’t modify PDB$SEED. Create a new PDB with the modifications, then use that as the clone source, for new PDBs, instead of the seed. Stagger maintenance windows within a CDB so all PDBs aren’t doing maintenance tasks at the same time. Maximum number of PDBs increased from 252 to 4096. PDB memory management via resource manager. Ability to set CPU_COUNT at the PDB level to allow the equivalent of instance caging for the PDB. Hot cloning of PDBs and incremental PDB refresh. Application containers, to allow common definitions across all similar PDBs. Useful for ISVs who require many copies of the same PDB, like one for each customer. Remember, all talk of 12.2 is covered by the safe harbour slide, so those features might not end up in the final release. After speaking to Debaditya and Giridhar, we headed off to a panel session to close the day. As most people will know, putting me on a panel can be a dangerous thing. I ended up having something to say about almost everything. Panels are a mix of scary and fun. As usual, the session was followed by additional questions and conversations which lasted about an hour. After saying a few quick goodbyes, it was off to grab some food, then back to my room to sleep some more. Are you starting to sense a pattern here? Overall, day 1 was a really fun experience. Let’s hope day 2 does not come with quite so much jet-lag! 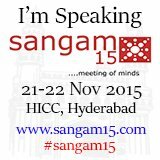 AIOUG Sangam15 : Day 1 was first posted on November 22, 2015 at 5:38 am.